15th November 1708, Westminster, London, England. William Pitt was the son of Robert Pitt from Boconnoc in Cornwall, the Member of Parliament for Old Sarum in Wiltshire and grandson of Thomas Pitt, the Governor of Madras in India for the East India Company. Eton College. Trinity College, Oxford, but left after one year without taking degree. 1735: After leaving Oxford University Pitt entered Parliament for the family Borough of Old Sarum where he was immediately attracting attention due to his opposition to the Prime Minister Sir Robert Walpole as one of the leading lights in the young “Patriot” Whigs. He also sided with Frederick Louis, the Prince of Wales against the King. 1744: He inherited an income from the Duchess of Marlborough and the Somerset estate of Burton Pynsent then became the family seat of the Pitts. 1746: William Pitt was appointed Paymaster General by Henry Pelham. 1755: He continued as Paymaster under Sir Thomas Pelham-Holles, Duke of Newcastle’s administration caused by the death of Pelham but was dismissed in November due to his criticism over the government’s war policy. 1756: Pitt was appointed Secretary of State for the Southern Department in a coalition with Newcastle, at the outbreak of the Seven Years War with France and immediately put into place war plans and raised a militia and strengthened the Navy. 1761: Disagreements with the new King George the Third led to his resignation particularly as the majority of the Cabinet refused to declare war on Spain. He then spent five years in opposition. Pitt received a pension of £3,000 and his wife, a sister of George Grenville, was created Baroness Chatham, thus making him the First Earl of Chatham. During this time he was bitterly opposed to the government’s attitude to the American colonies and in particular hated the harsh measures then being introduced. 1766: William Pitt was recalled and became Lord Privy Seal and thus nominal Prime Minister, in another coalition government which he controlled from the House of Lords as Viscount Pitt, Earl of Chatham. This time was less successful than his first period of office however, and he also suffered from ill health. Although he did not agree with American independence he was still heavily opposed by the crown and opposition for his stance towards the colonies. 1768: William Pitt resigned as Prime Minister. Spent much of his later time in Parliament calling for parliamentary reform and the relaxation of colonial policies. 1778: On 2nd April opposed to peace with America on any terms he went to the House of Lords for the last time and secured a vote against the motion. The effort of the debate exhausted him and he collapsed into the arms of his friends witnessed by his son William Pitt the Younger. He died a few weeks later and was given a public funeral and the government paid off his substantial debts. 11th May 1788, Hayes, Kent, England. 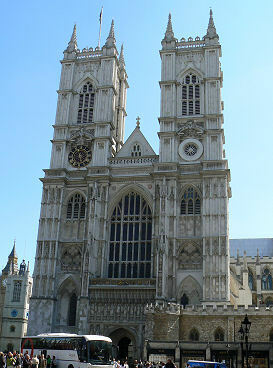 North Transcept, Westminster Abbey, London, England. Lived at No 7 The Circus, Bath.